Install your GAUSS Software before installing GaussX. Be sure to request your GaussX License Key when you request your GAUSS License. If you purchase GaussX AFTER you obtain your GAUSS license, you will need to request a new GAUSS license from Aptech that is configured to work with your GaussX License key. Request GAUSS License file and GaussX License Key here from Aptech. GaussX is distributed as a zip file. Download the GaussX zip file (Gaussx_win-10.X.zip) from your Aptech Download Account. Unzip the file in a temporary folder by double clicking the zip file. Select the file Setup.exe. The GaussX program files are extracted and compiled by GAUSS during the Set-Up process. Select the Platform of the computer you are installing GaussX onto (32 bit or 64 bit). 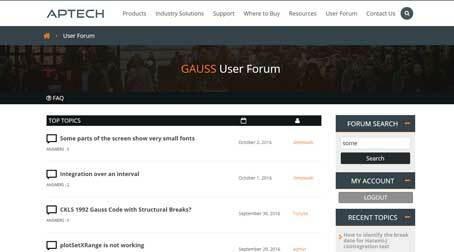 Browse to your GAUSSHOME directory, such as c:\gauss19. GaussX will automatically populate the version of GAUSS you are running and the GAUSS License ID number from your GAUSS License file into the GaussX screen. Enter the GaussX License key provided by Aptech and press 'Validate' button. GaussX is distributed as a zip file. Download the GaussX zip file (Gaussx_unix_mac_10.X.zip) from your Aptech Download Account. Unzip the file to the GAUSSHOME folder. Note that the /SRC folder and the /LIB folders already exist, so don't replace them. If you are installing GaussX v10 on a Windows 7 or higher computer, you must have administrator privileges to install and run GaussX. If you do not have sufficient administrator privileges, you will receive Error Number: 5 / Error in sub Register.RegGetVal. Follow the Windows Installation instructions above. Double-click the desktop icon to start GaussX. This error occurs because the GaussX compile did not take place. Users with non-standard configurations may need to undertake parts of the installation process manually. In particular, if the folder /Users/yourname/gauss19/cp/ is empty, then compilation did not occur during the installation process. Start up GAUSS and ensure that GAUSS is working correctly. Select the GAUSS Command Window.